Big art. There's a lot of it about, from murals to giant sculptures to wonky dinosaurs. We've rounded up ten favourites, with further suggestions from our Facebook friends at the bottom. How do we define massive art works? Something that's arty and massive? Mostly, but some of these are more building than art. Others, being murals, have very little mass. It's all very subjective, and that's half the fun. Your own suggestions are very welcome in the comments below. Note: we've excluded street art, temporary installations and art works that are rarely accessible to everyday people (with the possible exception of number 1, as it's a bit special). A controversial one to start, given that it's (a) as much tourist attraction as art, (b) not yet complete, (c) got a name and form that are seemingly designed to get the cynics sniping. Still, we're slowly warming to the random swirls and striking hue of this proto-landmark. It's bound to be popular during the Olympics. Once West Ham, who play in a similar claret colour, move into the stadium, it might just achieve iconic status and head a list such as this in a few years time. Or not. You could easily pass by this hulking steel structure without clocking it. But Serra's Broadgate contribution has a hidden menace for those in the know. The five 17-metre slabs are not welded or attached to each other, but rely on mutual support to stop them crashing to the street. Keep that in mind as you duck into the small den within this monumental sculpture. David Gentleman is a god of London illustration. Trust us, you need to own this book. His most famous work can be found on the platforms of Charing Cross. At 100 metres span, it's surely the longest permanent work of art in London, unless you know different. 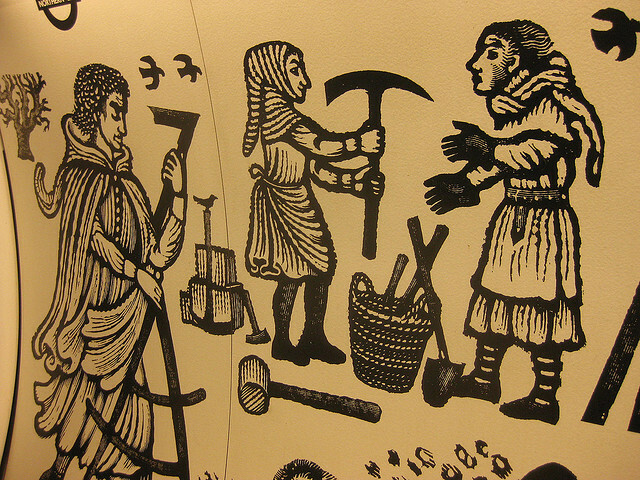 The panels depict the medieval construction of the original Charing Cross, a replica of which now stands outside the station and might be considered a giant work of art in its own right. Award yourself 10 points if you've spotted the long-blocked 'staff letters' box painted into the scene. If the Yellow Submarine came with a bar code, it'd look a little something like this. 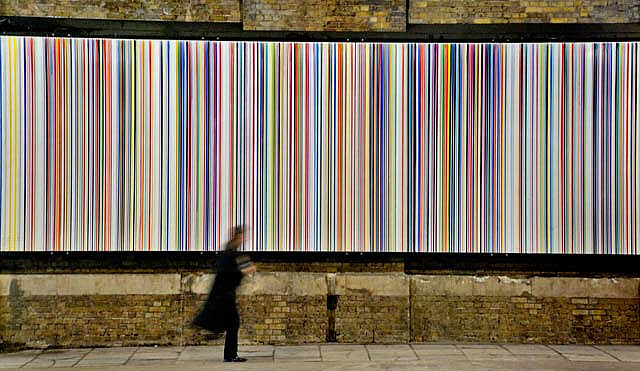 Poured Lines contains hundreds of coloured stripes created over two years by a very patient artist. The 48-metre-long painting has received increased attention of late, with the Thames Path diverting along Southwark Street due to works on Blackfriars Bridge. 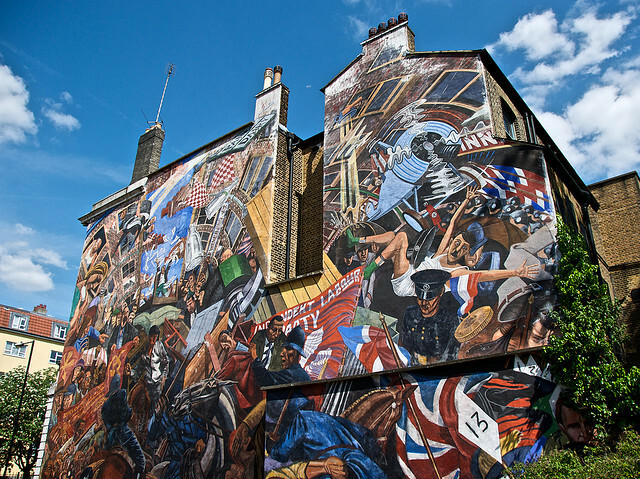 London contains some world-beating murals (as your correspondent discovered while moonlighting for Time Out a few years ago). This incredible depiction of the famous 1936 incident, when locals rebuffed the fascist blackshirts of Oswald Mosley, is the only work on the list to contain an eight-foot Hitler in suspenders. A zoomable panorama can be found here. Gormley's installation on the eastern side of Greenwich Peninsula shifts shape when viewed from different angles, revealing a hazy human outline at its centre. 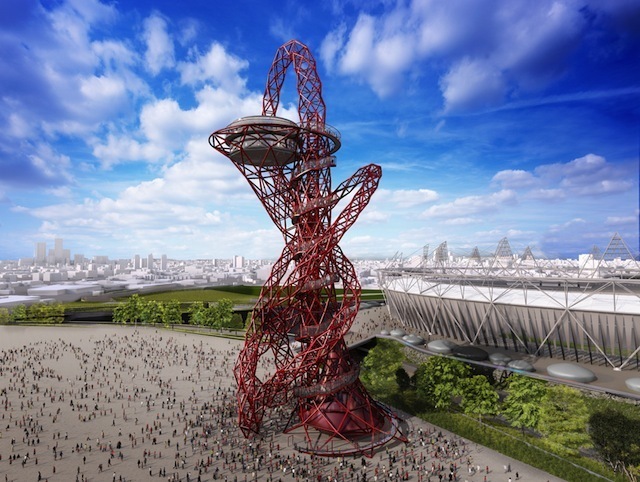 The cloud is taller than the artist's Angel of the North, yet remains relatively obscure (a situation that will no doubt change when the planned Thames Cable Car is installed right next to it). 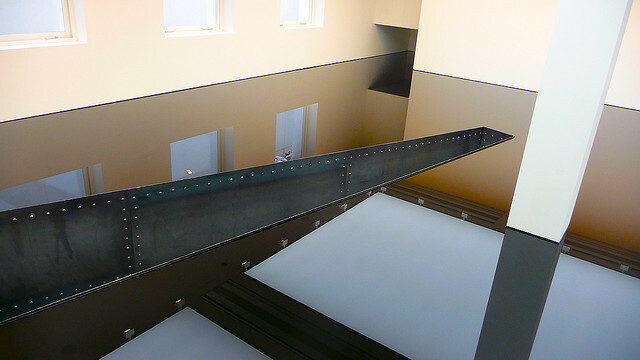 Nearby, you'll also find Richard Wilson's Slice of Reality, a water-based cross-section through a ship. We can't let these modern artists claim all the top spots. Nor can we quite bring ourselves to put Gilbert Scott's dazzler at the head of the list. It's just too familiar. Still, the memorial to Victoria's consort has much to recommend it, including the elegant corner sculptures, the night-time illumination, and the fact that it contains secret chambers. The only entrant on our list that you can smell before you can see. Saatchi holds Wilson's pool of engine oil in such high regard that it now occupies a room custom-built for its display, and is the only permanent exhibit in the building. The aroma, reflections and simultaneous feelings of tranquility and unease make this oily work anything but crude. The second largest medical charity in the world (behind the Bill and Melinda Gates Foundation) harbours a suitably large sculpture in its headquarters. Bleigiessen stretches 30 metres up the western side of the Gibbs Building, and requires a ride in the adjacent glass lift to be fully appreciated. The steel and glass bead structure is the creation of local boy Thomas Heatherwick, who also designed the rolling bridge at Paddington and the metallic porch at Guy's Hospital. Bleigiessen (which gets its name form a Central European New Year's tradition of 'lead guessing') is normally off limits, but qualifies for our list thanks to public tours on the last Friday of each month. We also asked the question 'what's your favourite bit of big art' to our Facebook friends. Additional suggestions (that fit our criteria) included the giant plug off Carnaby Street, the Fitzrovia mural, Old Street Roundabout (! ), the Shardeloes Road poem, The Lineout sculpture at Twickenham, the Animals in War Memorial near Hyde Park, the mechanical boat-fountain in Hays Galleria, the British Library's murals and the 'Hoxton Street woman'.